Smokin Blue BBQ is a competition and catering company based out of Owasso, OK. We were created through a passion for BBQ and have spent years perfecting our techniques and flavor profiles that allows our BBQ to be ranked as one of the best around. We caterer all types of events with award winning brisket, ribs, chicken, pork, ham, bologna, sausage and our amazing sides. We also compete anywhere from 6 to 10 times a year in OKBS and KCBS competitions across the nation. Take a look at our photo gallery, connect with us on Twitter, Facebook, YouTube and contact us to cater your next event. "I love BBQ! I love the preservation of this primitive type of cooking. I love it so much that I compete at the highest level of the KCBS circuit. I’m a self-taught Pitmaster, and what initially began as a hobby has now become a way of life. 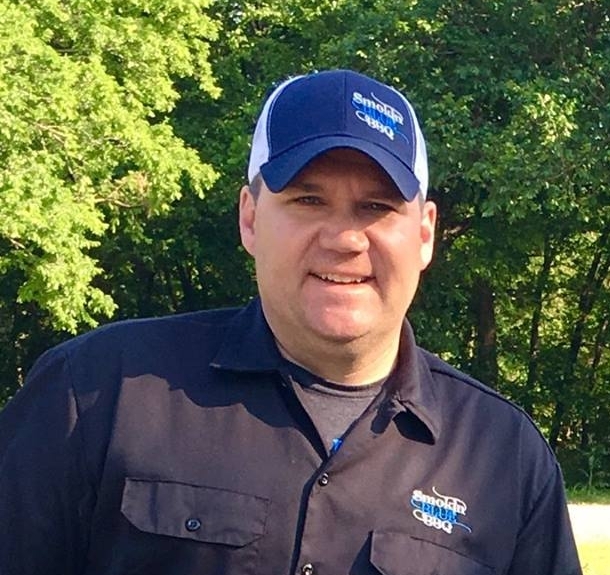 I am passionate about maintaining the integrity of BBQ by cooking with authenticity, using simple recipes, fresh product and honoring the history of our craft." Bring the taste of Smokin' Blue to your kitchen with our rubs, sauces, and merchandise.